I dropped off a box of donations at the charity shop today. What I saw made my heart break. The whole of the back of the shop was a junkyard. People had dumped broken tables, broken chairs, a mattress so stained and old I’m surprised anyone had used it in years…or maybe they hadn’t. When I put the box of carefully folded, sorted clothing inside the door, I passed a single broken shoe that someone had carelessly thrown in the porch. People are using charity shops as junkyards, not as a way to genuinely help those in need with items we don’t need any more. I’ve talked with the staff there. All volunteers, apart from the Manager. They’ve said they get so much rubbish they don’t know what to do with it. A full sized skip (dumpster) goes out every fortnight, and it’s packed full. That skip is full of rubbish we’ve dumped at them, because we were too lazy to sort our cast-off belongings. Or maybe we saw it as the cheap alternative – instead of disposing of things properly, using the charity shops as a dumping ground for trash. Do the poor deserve our junk? That’s what I’m asking. Do we really think they deserve our rubbish? Because I’ve known plenty of poor people in my life, although I’m been blessed enough to never have been poor myself. They were mostly ordinary people just like me, who were doing it hard through no fault of their own. They didn’t deserve to be poor, any more than me. I don’t think anyone deserves my junk. If the best I can give is my rubbish, then I am the problem here. And look: if you think all poor people deserve to be poor, please just walk away from this blog now. Because we have nothing to say to one another right now. When we bring items to donate, we should be asking: Could I use this? Would I give this to a friend in need? Would I give these shoes / this jacket / these jeans to a little girl or boy I genuinely cared about? If the answer is no, then cut them up for rags or throw them away. And no, nothing is ever “too good” for the charity shop. Giving our best to charity should be a natural thing, not something we avoid. Charity should be a gift from the heart, a gift with kindness and thought attached – the only strings it should ever have. 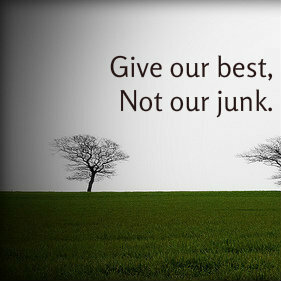 It should be something we do because we care, not because it’s a convenient way to dispose of junk. Kindness is a virtue. Maybe it’s time we all remembered that. Like you, it always amazes and depresses me when I see what some people “donate”. You should not donate broken, stained, or worn past usable clothing and other items. Your trash bin is where these belong. It angers me to think they think anyone would want it or that they can claim a tax deduction for it. Sadly, I suspect the not thinking reason first. So glad you see it this way. I find it maddening what some people will “donate”. Keep up the good work. Hi – It really is! But some of the charities here in New Zealand just have drop off points out the back of their shops and people use them as general dumping groups for their rubbish. It’s awful. I’m sure that people accepting charity understand they’re often not going to get brand new items, but they deserve to receive charity that is solid, usable things they need, not our junk.